ClubCoins Needed: 128 Games are not compatible with mobile and tablet devices. Please add this title to your Wish List and sign on to your the first club account from a desktop computer to complete your redemption. NOTICE: Activation key must be used on a valid Steam account, requires internet connection. ABOUT THE GAMEThe US President must save the Earth from alien overlord Zinyak using an arsenal of superpowers and strange weapons in the wildest open world game ever. The epic conclusion to the game that changed all the rules! The Saints have gone from the crackhouse to the White House—but the Earth has … been invaded and it’s up to you to free the world from Overlord Zinyak and his alien empire. With homies new and old by your side, and an arsenal of superpowers and strange weapons, you must save the world in the wildest open world game ever!KEY FEATURES The American (Fever) Dream – Play as the President of the United States in a story that spans countries, space, and time. Saints Row IV is to Saints Row: The Third what Saints Row: The Third is to Do The Right Thing. You’re not ready. Super Hero-in-Chief – Leap over buildings. Kill people with your mind. Run through tanks. Those are some of the most mundane powers you will wield in your quest to stop an alien menace hell-bent on destroying the Earth. Alien Toys of Destruction - Wield an impressive array of alien vehicles and weapons… FOR SCIENCE! Custom Weapons, Custom Mayhem – You’ve customized your character. You’ve customized your clothes. Now you can complete the look with our all new weapon customization system. Turn traditional weapons into exotic conversation pieces! Dynamic Duo - Seamless drop-in, drop-out co-op, a Saints Row standard, improved. The only thing better than one malicious super-powered President is two.SYSTEM REQUIREMENTS Windows Minimum: OS: Windows Vista (x86 or x64) with SP2 installed and DirectX 11 update installed Processor: Any Quad Core Processor (Intel Core i5 or AMD Phenom II X4) or 3.0+ Dual Core CPU Memory: 4GB System RAM or more Graphics: 1GB Video RAM GPU w/ Shader Model 4.0 support. NVIDIA GeForce GTX 400 series or better. ATI Radeon HD5000 series or better For demonstration of the game, please use GTX560 and above or ATI HD 5870 and above DirectX: DirectX 11 Hard Drive: 10 GB Sound: 100% DirectX 9.0C compliant sound card or equivalent onboard sound Recommended: OS: Windows Vista (x86 or x64) with SP2 installed and DirectX 11 update installed Processor: Intel Core 2 Quad Q9300 (4 * 2500 MHz) or AMD Phenom 9850 (4 * 2500 MHz) Memory: 4GB System RAM or more Graphics: Radeon HD 5850 (1024 MB) or GeForce GTX 260 GTS (1024 MB) DirectX: DirectX 11 Hard Drive: 10 GB Sound: 100% DirectX 9.0C compliant sound card or equivalent onboard soundLinux Minimum: OS: Ubuntu 14.04.3 LTS or SteamOS Brewmaster Processor: : Intel Core i3-2100 (3.1 GHz) or AMD Athlon II X4 645 AM3 (3.1 GHz) Memory: 4096 MB de mémoire Graphiques : GeForce GT 440 (1024 MB) or Radeon HD 6670 (1024 MB) Hard Drive: 10 GB d'espace disque disponible Notes: Recommended Graphics Drivers: Nvidia: 352, 355 or 358 series driver / AMD: AMD Catalyst (fglrx) 15.9 or better. MESA drivers and Intel Graphics are not currently supported. Recommended: OS: Ubuntu 14.04.3 LTS or SteamOS Brewmaster Processor: Intel Core i5-2500K (3.3 GHz) or AMD FX-4300 (3.8 GHz) Memory: 8192 MB de mémoire Graphiques : GeForce GTX 660 (2048 MB) or Radeon HD 6970 (2048 MB) Hard Drive: 10 GB d'espace disque disponible Notes: Recommended Graphics Drivers: Nvidia: 352, 355 or 358 series driver / AMD: AMD Catalyst (fglrx) 15.9 or better. MESA drivers and Intel Graphics are not currently supported. © 2013 by Koch Media GmbH, Gewerbegebiet 1, 6604 Höfen, Austria. Deep Silver is a division of Koch Media GmbH.Developed by Deep Silver Volition, LLC. 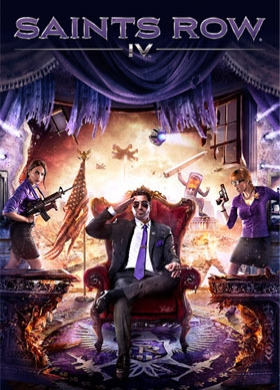 Saints Row, Deep Silver and their respective logos are trademarks of Koch Media. All other trademarks, logos and copyrights are property of their respective owners. All rights reserved.